This present work seeks to study the thought of the eighteenth century Delhi Sufis about the contemporary political decline and low moral tone of society. 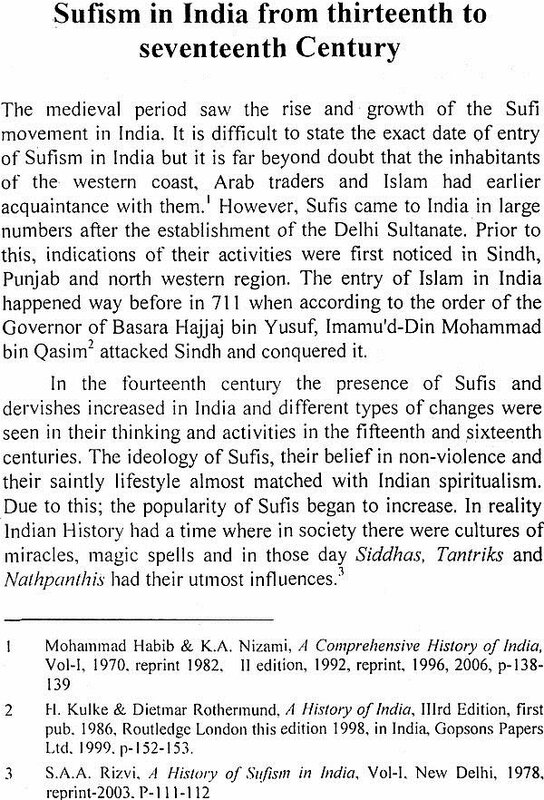 The Sufis not only identified the causes for the political decline, sectarian conflicts and disintegration of the society but also pointed out the remedies for political uplift and social reform. The author finds it efficacious to combat social and political upheavals, which are brought about by prolonged political instability associated with autocratic oppression and economic deprivation. This book outlines the information about the origin of Sufism, early Sufis, foundation of Sufi orders, advent of Sufism in the Indian subcontinent and then goes on to discuss the principal trends in Sufi development from thirteenth to the eighteenth centuries. The author of this work present an analytical study of the eighteenth century Delhi Sufis socio-political thoughts, observation and suggestions. Dr. Bhavesh Dwivedi belongs to Allahabad, Uttar Pradesh. He has completed his higher education and D. Phil. from the University of Allahabad. He has participated in a large number of national and international conferences and seminars. Dr. Bhavesh Dwivedi, who writes with equal ease in English and Hindi, has contributed a score of papers to renowned national and international journals. Sufism and Sufis have contributed significantly to the enrichment of the glorious Indian civilization. 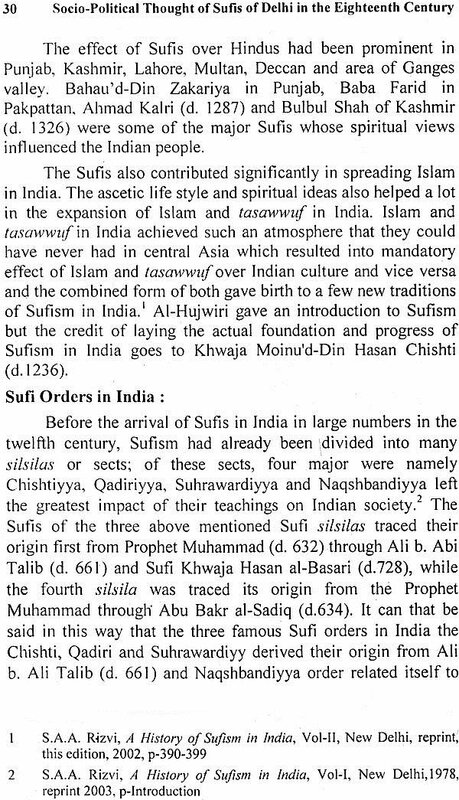 In fact, it would be no exaggeration to suggest that in the making of India's composite culture, which is the greatest legacy of Medieval India to Indian civilization, the contribution of Sufis has been second to none. By their words and deeds, they helped create an environment in India which was largely free of sectarian and communal tensions. They preferred to communicate in local dialects,' welcomed all visitors to their abodes, fed and assisted all those who approached them for succor irrespective of their religious affiliations, respected indigenous cultural traditions and in the process won the heart of innumerable followers. Service to humanity was their motto and winning the grace of God by showing compassion to His creatures was their objective. 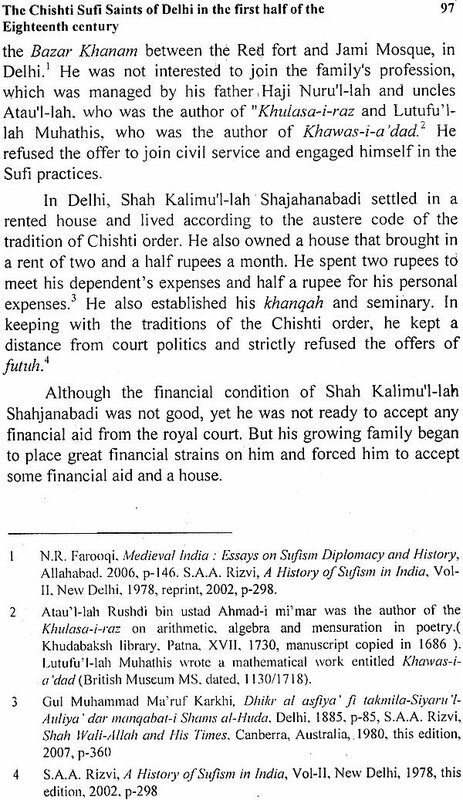 The charisma and spiritual prowess of the Sufis as well as their piety and rectitude attracted the attention of many a member of ruling class as well. Monarchs and mandarins felt obliged to pay a visit to their humble dwellings and vied with each other in offering landed property and cash stipends to them. They built imposing structures over the graves of the Sufi masters and facilitated the visit. of the devotees to these shrines. The death anniversaries (Urs) of the Sufis were celebrated with great fan fare in which the rulers and commoners participated with equal zeal and reverence. Reading of the collection of discourses (malfuzat) of the Sufi masters became the favourit pastime of the educated and the learned. Sufism and especially Indian Sufism has attracted the attention of a galaxy of scholars in modem times. The works of Muhammad Habib, Khaliq Ahmad Nizami, Saiyid Ather Abbas Rizvi, Carl Ernst, Richard Eaton, Bruce Lawrence, Simo Digby, to name a few, have unfolded myriad dimensions of Indian Sufism in medieval ages before us. There is however ample scope of further research and writing on Indian Sufis and Dr. Bhavesh Dwivedi's book "Socio-Political Thought of Sufis of Delhi in the Eighteenth century" is a recent addition to the existing literature on the subject and deserves the attention of the lovers and admirers of Indian Sufis and Sufism. The book is divided into six chapters besides introductory and concluding remarks, bibliography and four appendices. The introduction outlines the main facets of classical Sufism and recounts the gradual rise and popularity of Sufism as an institution. In the same vein, the first chapter focuses on the advent of Sufism in India and the essential features of diffusion and expansion of various Sufi orders in the Indian sub-continent between the thirteenth and seventeenth centuries. In the second chapter, the author has furnished a succinct summary of the political, social and cultural fabric of India in the eighteenth century along with an account of the prominent Sufi centres and saints of the time. 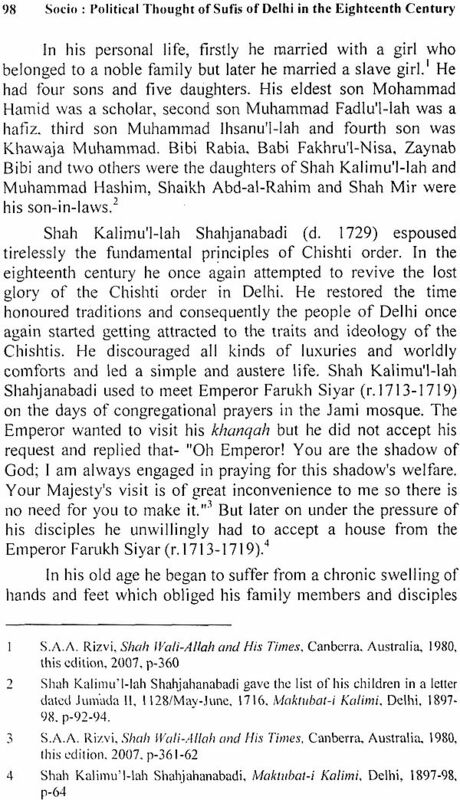 The following chapter provides detailed study of the Chishti saints of Delhi flourishing in the first half of the eighteenth century. 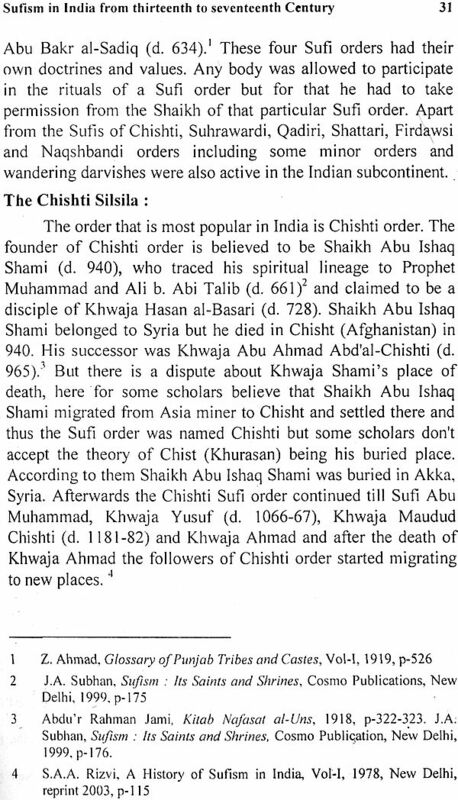 Dr. Dwivedi has discusse the contribution of these Sufis in the revival of the Chishti order in Northern India and their role in reforming the religious and moral life of the Muslims at large. 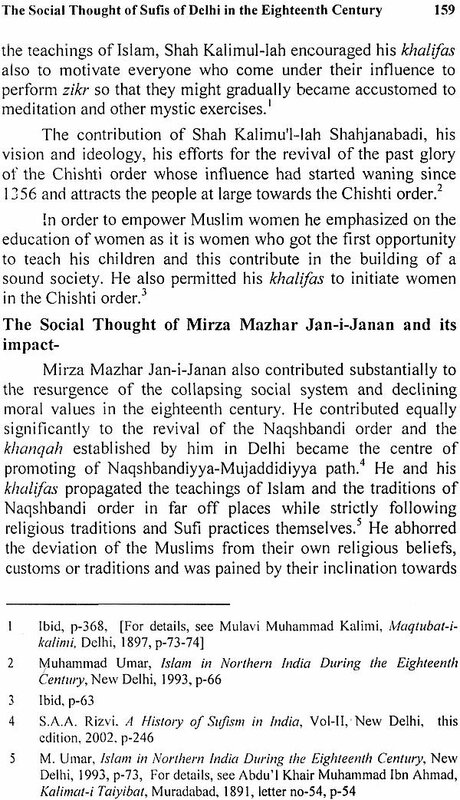 Chapter four gives an account of the major Naqshbandi saints of Delhi in the period under review and highlights their contribution in rectifying the social and moral fiber of the Muslim society of their times as well as their efforts to infuse a new lease of life in the sagging Muslim political system in the days of the decline of the Mughal empire. The last two chapters are perhaps the most important segment of the book. The first of these (chapter 5) brings into sharp focus the impact of a declining political system on the social, religious, moral and economic life of the Muslims in the eighteenth century. This chapter also analyses the role of the Sufis in keeping the society free of communal and sectarian salvation tensions and in reminding their fellow Muslims that their salvation lie in going back to the basics and obeying the commands of God as well as the teachings of the Prophet. The last chapter reviews the efforts, albeit unsuccessful, of the Sufis specially Naqshbandis of the eighteenth century in the revival of the political fortunes of the Mughal empire. Dr. Bhavesh Dwivedi has used practically all the primary and secondary sources on the subject and has obviously put in a lot of efforts while writing this book. His language is simple and easily comprehendible and is bereft of technical jargons that more often than not undermine the literary merit of an academic work. I am confident that the book will be well received by the students and scholars of Indian Sufism. The Sufis of Delhi played a catalytic role in reforming political system and society in the Eighteenth century. 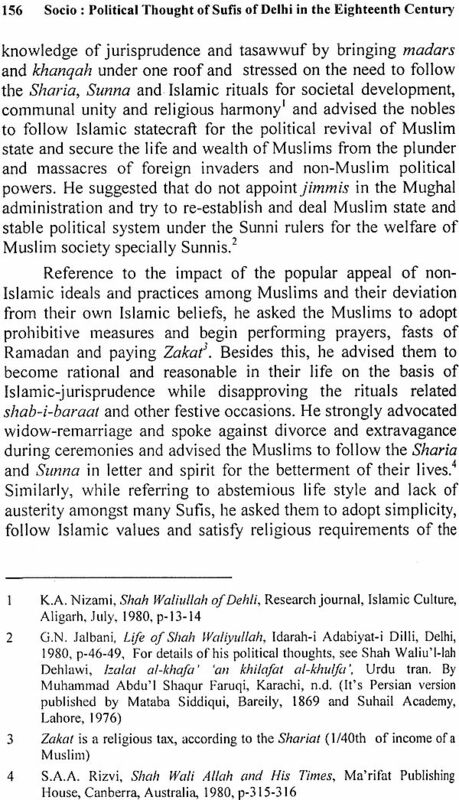 The political religious and social decline of Muslims did not allow Sufis to remain confine to their paths of mysticism and spiritualism instead it compelled them to interfere in political and social affairs as a moderator in order to satisfy the need of the time to maintain peace. harmony, integrity and welfare of mankind. The present study does not lay claim to having brought to light something altogether new or to disclose anything hitherto entirely unknown. 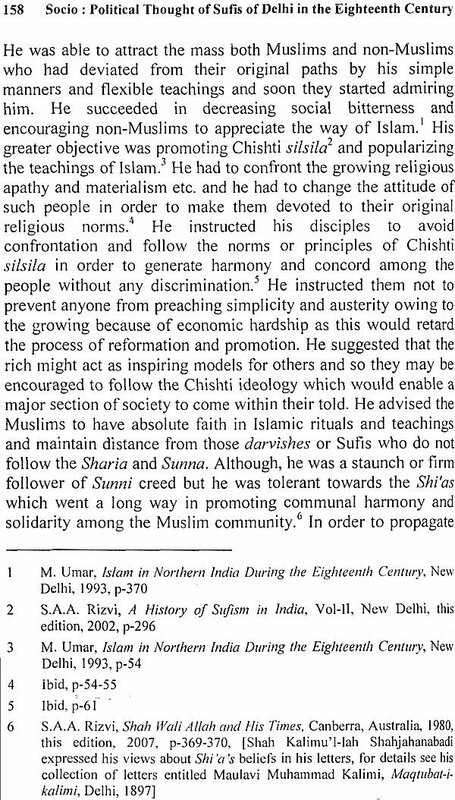 However, it is hoped that it will make some contribution to a better understanding of this dimension of the eighteenth century Delhi Sufis's socio-political thought by putting together the relevant material in a manner that would bring out its significance and help an appreciation of its meaningful implications. The writer would like to acknowledge his gratitude for the help and encouragement provided to him by Prof N. R. Farooqi, Ex Vice-Chancellor. University of Allahabad, who spared no means to assist him in completing the work, providing all resources at his disposal for that purpose. The writer is indebted to Prof. N. R. 'Farooqi for his guidance extended from the initial steps to the final stage of the work. I am grateful to Prof. Heramb Chaturvedi for his expert advise. I am especially grateful to Prof. Yogeshwer Tewari, Department of Medieval & Modern History, University of Allahabad, for his earnest attention, expert advice and encouragement, My friends were always a source of encouragement and strength; I am also indebted to them. Lastly, I would like to thank my parents and family members who are constant source of inspiration and encouragement throughout my work and it is only because of their blessings that I am able to write this book. Above all, I am grateful to the Almighty God for giving me the strength and courage of conviction to see this work through. I do not have sufficient words to thank him. One distinct reality of lndian society in the eighteenth century was the presence of Sufis of all hues and shades in practically every nook and corner of the country. Many of these Sufis had large following and left: a deep impact on the lives and activities of their followers. 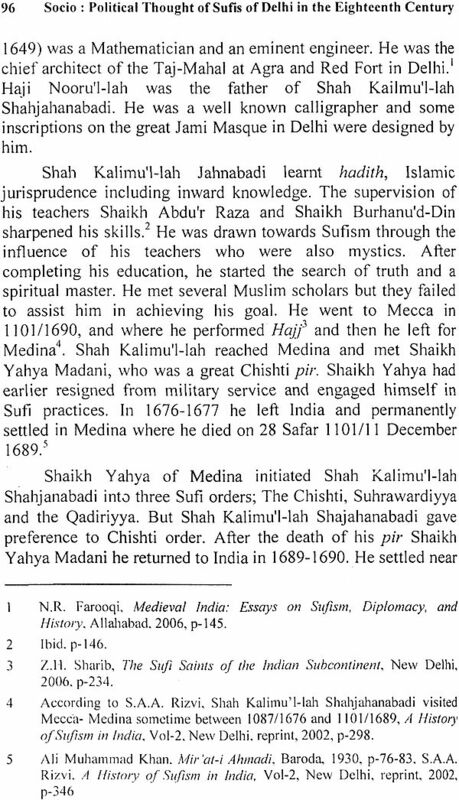 An intensive study of the Indian Sufis in the eighteenth century and their impact on contemporary society is therefore imperative to assess the overall nature and character of eighteenth century and also to ascertain its causes of its success or failure in stemming the tide of political decline. The term Sufi is generally, used for Muslim mystics. I Therefore, Sufism can only be understood by keeping into consideration their practices, teachings and thoughts and other related variables associated with them.' So in simple words Sufism can be defined in the words of the distinguished Sufi Abu Mahfuz Maru' f ibn Firuz al-Karkhi (d.816) as an attempt to gain/achieve/attain/ seek the knowledge of the sublime, sole or ultimate truth is only 'tasawwuf' and so, the followers of mysticism called themselves Alh-al-Haqq. Here it may be mentioned that for the Sufis the mode of knowing the sublime truth or attaining unity with divinity is known as tasawwuf and its seekers are known as Alh-al-Haqq. Although the term Sufi is broadly used for the practitioners of Muslim mysticism and that contrary to the belief of some of its detractors, they did not have any intention or tendency of going against the principles of Islam. Instead 'their prime objective of knowing the truth was through following Islamic principles and their practices were within the parameters of the holy Quran and hadiths. Therefore, the teachings and impacts of Sufism can only be understood by exploring within the circumference of Islam. In the medieval period, Sufism played a vital role in resuscitating Muslims civilization who were adversely affected by adverse political, economic and cultural factors which was perceived to have been caused by ethical or moral decline owing to inclination towards materialism'. Sufism also seems to have inculcated the elements of adaptability and accommodation or adjustment within the fundamental Islamic structure and consequently strengthened Islam. Sufism was thus for some an initiative to. deviate from conservatism or rigidity and move towards liberalism. The origin of Sufism has been a subject of debate among scholars. 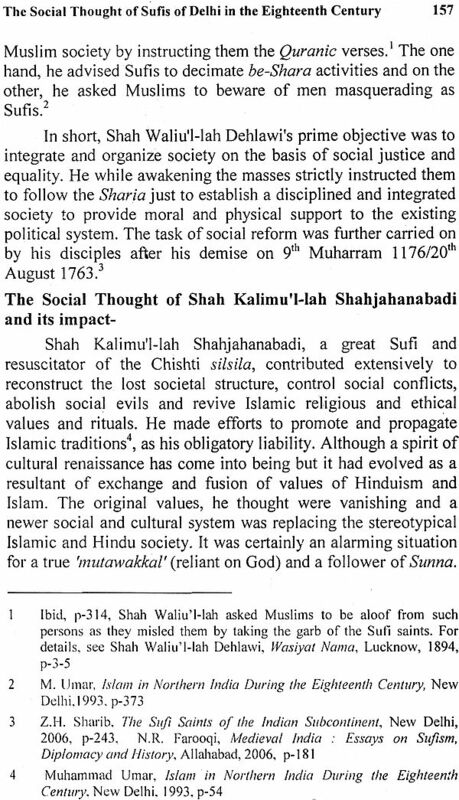 Actually this did not evolve or originate on its own but emerged by the conscious efforts of Muslims who were ready to follow the path of renunciation or sacrifice and who were desirous to focus on moral or ethical values instead of blindly following the existing rituals or religious system and which were probably difficult to follow and irrelevant in contemporary situations. It was solely related to the human values and was an attempt to attain the knowledge of divinity which was also a way to relate oneself to the reality. The philosophy of Sufism is based upon the premise that the divinity or God is the Sublime Truth which is the cause of this extraordinary world and that He can only be realized or understood through love and reverence and not by blindly following ostentatious rituals. The Sufis believed that man is part of that supernatural supreme authority which can be realized and attained only through devotion and reverence and for this meditation on the Reality is essential. This also involved a process of deep and thorough contemplation or cogitation of divine knowledge which carries the self toward! divinity. 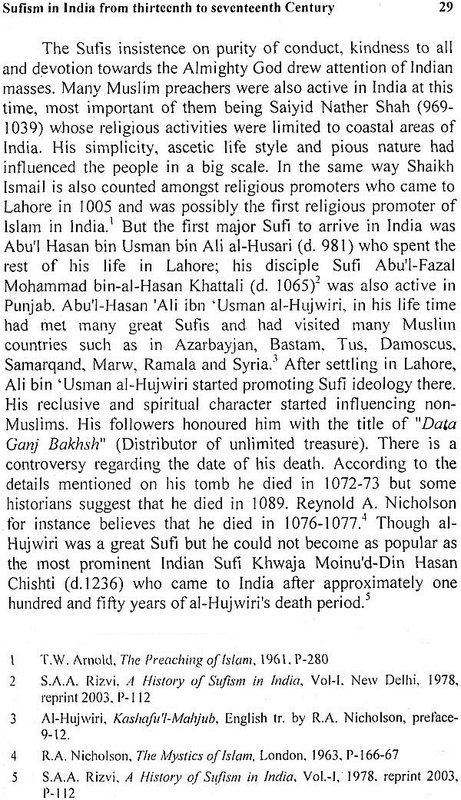 Some scholars emphasized the influenced of Hellenism Buddhism, Hinduism and Christianity in the emergence of Sufism but contrary to them Reynold A. Nicholson suggests that it originated from and was influenced by the holy Quran, hadith, and Prophet Muhammad's life style. He has emphatically described the verses of the holy Quran and hadith as the basis of Sufism. He suggests that tasawwuf was not a derived or borrowed institution and that instead it rests upon original and fundamental principles of Islam which distinguishes it from other mystical systems. The mysticism of other religions, he says, emphasize on renunciation, asceticism, sacrifice or absolute isolation from worldly affairs and materialism where as Islamic mysticism, contrary to them, does not absolve the Muslims from social or religious liabilities or duties inspite of indifference to worldly or material illusions. In fact, if anyone succeeds in attaining his objectives which remaining indifferent to one's social or worldly liabilities then such an attainment is considered to be meaningless as this simply represents isolation from worldly affairs and materialism and not the attainment of the knowledge of the divinity. Sufis therefore believed that the source and end of all worldly affairs is God and His knowledge can only be realized through love, serenity, devotion as well as continuous meditation and not by logical discussion. The followers of this philosophy or ideology were perceived as Muslim mystic or Sufi and the creed or cult which they followed was Sufism or tasawwuf. Mysticism did not only remain a subject or matter mental cogitation but also a way of life in this world. 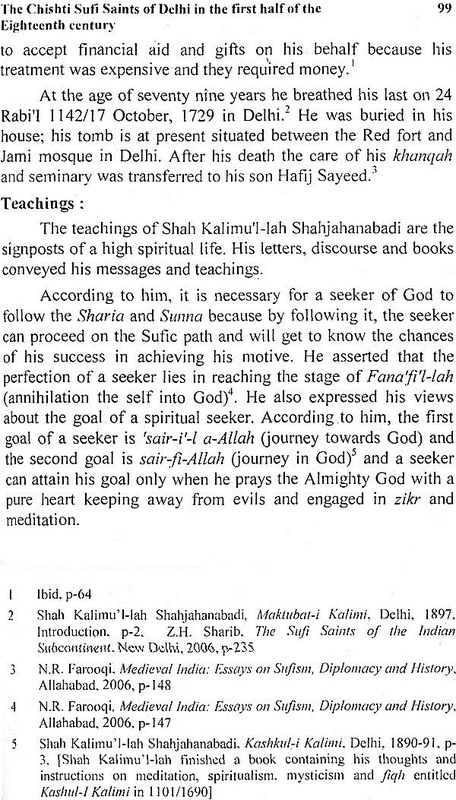 While following the Sharia, the Sufis tried to understand the relationship of God with each creature and passionately tried to achieve unification with God. Their passion towards the Divine reflects through the love, devotion, prayers and practice followed by them. Sometimes they would sit and meditate for hours, indulge in philosophical discourses and sometime expressed their feelings through poetry reflecting their passion towards Divinity. Due to this, poets like Baba Tahir, Abu Majd Majdud Sana’ i (d. I 130), Faridu'd-Din Attar (d.1220) and Jalalu'd-Din Rumi (d.I273) are often placing in the category of Sufis along with the popular Sufis such as Khawaja Hasan al Basari (d.728), Malik bin Dinar (d.744), Ibrahim bin Adham (d.778), Abu Nasr Bishr ibn al al-Haris al-Hafi (d.842), Abu Mahfuj Maru'f ibn Firuz al-Karkhi (d.815), Abu Sa'id Junayd al Baghdadi (d.910), Abu Sa'id Ahmad ibn Muhammad ibn Ziyad ibn Bishr ibn al-Arabi (d.953) and the eminent theologian Abu Hamid Muharnmad ibn Muhammad al-Ghazali (d. III I ).